Updated Aug. 22 with Sippel's ruling. — A federal judge has ruled that at-large elections for seats on the board for the Ferguson-Florissant School District violate the rights of African-American voters in the district. Three-quarters of the students served by the Ferguson-Florissant School District are black, but African-Americans make up a minority of the voting-age population in the district's boundaries. In a ruling issued Monday, Judge Rodney Sippel agreed with the American Civil Liberties Union and the NAACP that those two facts mean the rights of African-American voters are violated. "The fact that the electoral process in FFSD Board elections is not equally open to African Americans is most apparent in the stark levels of racially polarized voting seen in Board elections and the failure of white voters to support candidates from the African American community, which has essentially blocked African American voters from exercising effective political power in the District," Sippel wrote. Sippel has blocked the district from holding future school board elections until the voting rights problem is solved. The next school board election was scheduled for April 2017. 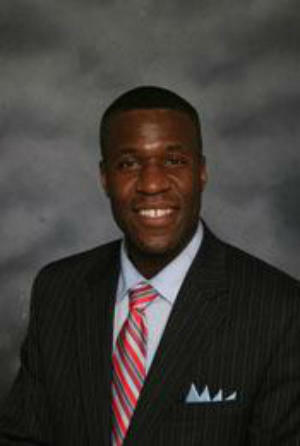 Nimrod Chapel, the president of the Missouri NAACP, said his organization was "proud of the result in this case." An attorney for the school board, Cindy Ormsby, said in a statement that the district was disappointed in the ruling, and was considering all options, including an appeal. "The District continues to believe that the current at-large electoral system is best for African American representation. In fact, the court found that whites in the District are a plurality of the voting age population. Therefore, the current makeup of the board, 4 whites and 3 African-Americans, would reflect a proportional representation," Ormsby wrote. Our original story (Jan. 10). Are African-American voters in the Ferguson-Florissant school district shortchanged because board members there are elected at-large? Or would dividing the district into subdistricts actually weaken the clout of black voters, not increase it? U.S. District Judge Rodney Sippel will hear arguments for both sides of the issue this week in a lawsuit filed by the American Civil Liberties Union. The ACLU claims that the racial history of the makeup of the board shows that African Americans do not have representation proportional to their population. Dale Ho, an attorney from New York who handles voting rights cases nationwide for the ACLU, says the shooting of Michael Brown in Ferguson in 2014 brought a sharper focus to the issue. But, he added, it really has been present since the 1970s, when the Ferguson-Florissant school district was created from the Ferguson, Berkeley and Kinloch districts under a federal court order. “This is a place where there are wide disparities across a range of socio-economic indicators, everything from income, wealth, employment, rates, home ownership, vehicle ownership,” Ho said. 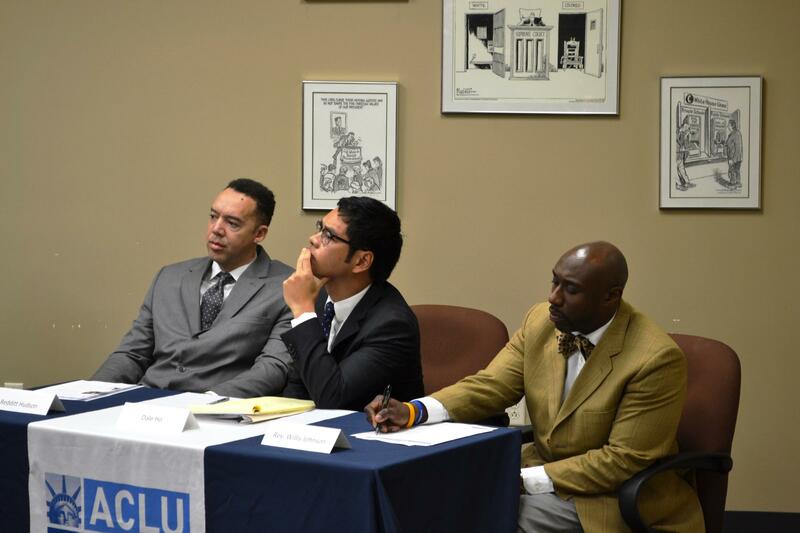 Ferguson-Florissant parent Redditt Hudson, attorney Dale Ho, and past school candidate Willis Johnson at a press conference announcing a lawsuit against the Ferguson-Florissant schools in 2014. Cindy Ormsby, an attorney for Ferguson-Florissant, counters that given the present racial makeup of the district’s voting population, breaking it into subdistricts for the board election would dilute the power of African-American voters. “We will show,” she said, “that the Ferguson-Florissant school district has a long history of African-American representation under the existing rules. In the context of the school district’s rapidly changing demographics, in which African Americans are the majority population, the current system facilitates the expansion of African-American representation, while the plaintiff’s proposal does not. The case is being watched by the Missouri School Boards Association. A spokesman there said the association has always preferred at-large representation on boards rather than representation by subdistricts. Sippel is hearing the case without a jury. The trial is expected to last for about a week. The suit was filed in December 2014 on behalf of three residents of the district – Redditt Hudson, F. Willis Johnson and Doris Bailey – against Ferguson-Florissant and the St. Louis County Board of Election Commissioners. At a news conference announcing the action, Ho and Hudson noted that it followed not only the shooting of Brown but the departure of Art McCoy, the first African-American superintendent in the district. McCoy was placed on administrative leave in November 2013, and he later resigned, but no details of any allegations of misconduct against him have ever been made public. At the time of his leave, no African Americans sat on the seven-member board. In 2014, one black member, Donna Thurman, was elected to the board; she is now vice president. Johnson was an unsuccessful candidate in that election. Last year, a second black member, Courtney Graves, was elected and had the highest vote total of any candidates on the ballot. Still, Ho said, because the district’s population is about 50 percent African American, and enrollment in the district is about 80 percent African American, the history of blacks’ success in elections points to a disparity that would be corrected with subdistricts. “No matter how you slice it,” Ho said, “the bottom line is that white voters in this district have never preferred an African American as their top choice for the school board. White voters and black voters have always had different choices in terms of their top choice for the school board. He called the McCoy incident “just one example of how this school board has not been responsive to the needs of the community, hasn’t looked at and been sensitive to concerns of African-American parents. Ho also said that staggered terms for the school board and having board members elected in April instead of November are additional factors that weigh against black representation. He said the Ferguson-Florissant case has national implications for equal voting rights. In its brief filed with the court, Ferguson-Florissant says that, according to the latest figures from the Census Bureau, 51 percent of the voting age population of the district identifies as at least partially black. Under those circumstances, it said, the ACLU position that four of the seven subdistricts of the board have a majority of black voters makes no sense. It also disagrees with any characterization of the success at the polls of Thurman and Graves as anomalies. The district’s brief argues that claims against the legality of current voting process have to be evaluated by taking into account all of the latest demographic data. Given these facts, the brief concludes, the conditions in Ferguson-Florissant do not violate the Voting Rights Act and the changes sought by the ACLU should not be granted. “This is an unusual case,” it says. White voters are a numerical minority and have been for a long, long time. “These unique circumstances make it extremely difficult if not impossible to find liability. In fact, the District has not found a case where Plaintiffs have been successful under these facts. These Plaintiffs should not be the first. The American Civil Liberties Union of Missouri, along with its national voting rights division, has sued the Ferguson-Florissant School District over the way members of the school board are elected. "Every community has the right to representation in their government," said Dale Ho, the director of the ACLU's Voting Rights Project. "Unfortunately for too long, African-Americans in the Ferguson-Florissant school district have been denied that opportunity." Updated with interview with McCoy and report on rally: Art McCoy, who was placed on paid leave from his post as superintendent of the Ferguson-Florissant School District in November, has resigned from his job, effective this Saturday. The move was announced Wednesday afternoon in a joint news release from McCoy and the district Wednesday.